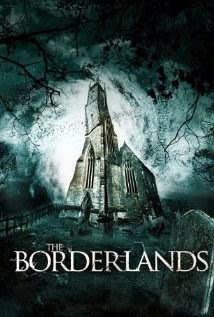 “The Borderlands” follows a team of Vatican investigators sent to the British West Country to investigate reports of paranormal activity at a remote church. “The Borderlands” provides evidence that an IMDb score isn’t necessarily a guarantee that a film is bad or excellent. I’ve seen movies that had a low score and still surprised me. This would-be horror still gets an exceptionally high score, but I found it depressingly bad. I even read someone’s opinion in which he suggested that he was afraid to look at the screen because it was too psychotic and shocking. I’m sure I’ve seen the censored version, because there was really nothing horrible or terrifying in this film. To be honest I also had trouble watching this movie, but this because of the urge to fall asleep all the time. “The Borderlands” tries to profit from the hype of found-footage films. It’s a kind of “The Amityville Horror“, but this time set in a church, mixed with a bit of “Paranormal Activity“. Although these activities are very limited. I promise I won’t reveal too much, since it’s already a very weak and thin story. Otherwise there will be absolutely nothing left anymore. The film refers to a religious aspect and especially the way the Catholic faith was imposed causing ancient primal religions being supplanted. The Vatican regularly sends a team of experts to certain places around the world where supernatural phenomena occur. The whole purpose is to investigate whether these phenomena are authentic or, as shown in most cases, simply are of a natural origin or pure fraud. So a team whose members are an Englishman, an Irishman and a Scotsman (sounds like a joke) , is given the task to investigate a case of paranormal activity in the local church in the British West Country. But I have to hand it, this film has the perseverance to keep all aspects related to a horror to a strict minimum so the end result is a bunch of meaningless components. First, the story is simplistic and not particularly innovative. The suspense part is anyway meager. A horror won’t be horrible because of a pair of sliding candlesticks, a burning sheep or a sheet full of meat maggots. A few scary noises and slamming doors won’t make it exactly a possessed church. I guess it’s rather due to the fact that the dilapidated church stands on a hill and therefore is subject to the forces of nature, including wind gusts. The found-footage section was also nothing to write home about. You have 3 investigators constantly walking around with a mobile camera attached to their head, shooting sickening swirling meaningless images. The technician on duty also covered the whole house where they were staying with fixed cameras (why exactly there, while the phenomena are occurring in the church, was a mystery to me). On these images which were shown constantly throughout the film was, what a surprise, nothing to see! At the end there remained one practical question: how the hell did they get those found-footage images ? And than the thing that got most on my nerves: the acting. What a bunch of implausible characters they scraped together here. First there’s the technician Gray (Robin Hill), who doesn’t believe there’s something spooky going on in the beginning and rather wants to scram as soon as possible, but eventually stays because of the bonus. But when the first candle in an inexplicable way hits the ground, he’s immediately convinced that something isn’t right. Then we have the firmly drinking Scotsman Deacon (Gordon Kennedy) who apparently made ​​a miscalculation in the past (with priests being murdered as a result) and they still blame him for that. And finally the fairly haughty Irish ambassador of the Vatican Mark (Aidan McArdle) who has a reasonable persevering attitude towards the poltergeist situation and has a plausible scientific explanation for each suspicious phenomenon. And the thing that almost gave me chronic diarrhea, was Gray ending every sentence with “Dude”. This stop-word was even used when talking to clerics. It seemed as if this ghost story took place in the slums of New York instead of on English soil. Fortunately there was no crucifix nearby, otherwise I had thrown it to my LCD TV after the 50th “Dude”. I’m not really a big fan of found footage (for the usual reasons) and till now I only saw a few that were quite worth it. However “The Borderlands” is on all fronts a big disappointment. Lousy renditions, absolutely no tension or suspense and a really farfetched and abrupt ending. The only positive is the claustrophobic closure and the sometimes sarcastic, humorous dialogues. The reason why I watched the whole movie is because I was curious how it would eventually end. Conclusion: yet another found footage hocus-pocus story without scary or intense moments, totally not original or groundbreaking, with a bizarre collection of characters like a gullible non-believer, a skeptic spiritual and a priest who should reread the Bible before using his fists again. Many parts are probably interesting for hardened hikers who dare to stretch their legs on weekends and make long walks through fields and woods (with the unpleasant confrontation with feces from ruminants). The end was eerie but came too late.